For all your Faerie Quest needs and much more! The taxman visits every 7 days from the time you click Create Store. The tax table is completed. Thank you to all of the players who were kind enough to send me their information. Of note here: The lower tax brackets have gotten a tax break with lower taxes while upper brackets, beginning with 500,001, have gone up. This means that for those of you who play to get your million and plan on taking a tax hit at the end will need to readjust your final figures to compensate for the higher taxes. A goal of 1.6 million should be sufficient to take the final hit and pay rents and still have plenty left over. The last tax bracket is INSANE! The Tax Dud takes nearly HALF?! The information for the January, 2005 tax brackets was obtained with the consent of many, many players who neomailed me their tax information. Most of the information was gathered in January, 2005. For more information on taxes, including all of the raw data that was used, click HERE to jump down the page. If you wish to use information that is available only on this petpage, please reference the petpage and its author. Thank you. A new prize structure was introduced in February, 2007 and tweaked in April, 2007. The trophy and avatar requirements are the same but the neopoint award is now awarded on a sliding scale based on your final Cash On Hand (CoH) and the number of plushies sold. The number of plushies sold MUST be complete batches. Information on the new prize structure is being gathered. The results can be found HERE. A new prize structure has been implemented. There isn't enough information yet to tell exactly how it works yet but the top prize for February's game was 200k. Hmmmmm...wonder what's in store for future games. For whatever reason, there was no PT game last month at all. I would like to extend a warm welcome to all the new members of the PT 100M Club. Until now, this club has had a membership of exactly 2 (TWO) people, myself and Dilowe. Congratulations to each and every one of you and Welcome to the club!! 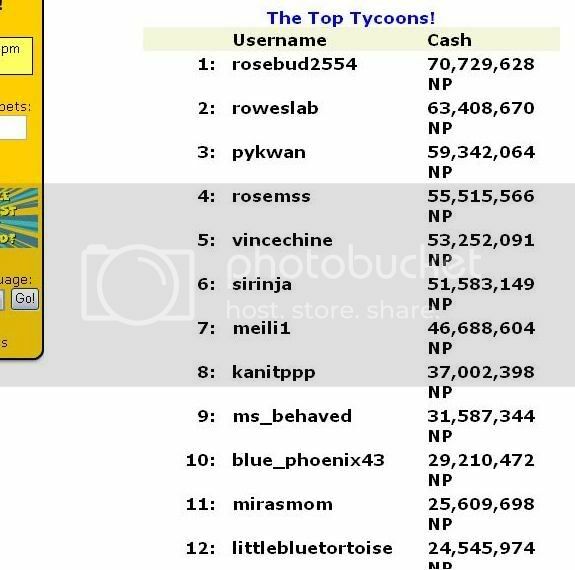 Regarding Plushie Tycoon random events. Please note that these are events that will ONLY take place in your Plushie Tycoon game. The post to kutyr is referring to what PT'ers call Lazy Worker Syndrome or LWS for short...this is when next to no plushies are produced even though your workforce was hired properly. The post referring to FF/250 is an issue with Firefox users not being able to hire 250 workers in one click like everyone else can. This month's game may become known in the PT History Book as the "Month of Missing Updates". More updates have gone missing in this game than in any other month I've ever played (since March, 2004). At this point, June 29, 2006, we have had 22 updates go missing. We had 4 vanish without a trace on June 9 (thank you sirinja and biggie_rat for the date), 4 more disapeared on June 18, another 4 MIA on June 20, 1 more failed to appear on June 23, an astonishing 8 on June 26, and 1 more straggled off on June 29th. New game begins. Hey! Better late than never! Game changes planned and a script error causes doubled prizes to be awarded. At least 7% taxes are now actually 7%..rather than 70%. You can now buy up to 50 of each material as long as you have over 150,000 Cash On Hand (COH). At the moment, the maximum your inventory can hold is 250 items. Once you drop below 150k COH, then you can only buy 10 at a time and your inventory will only hold 100....just like always. The tax percentages have changed and overall seem lower. I was taxed 13% on 248k COH. The Tax Dud made his first visit this month 7 days after starting the game. Tons and Tons of Changes August, 2005 has ushered in a vast set of changes. As of this writing on 8/6/2005, I have found changes in materials requirements (see table below), Warehouse expansions and rents, worker wages, and store rents. I'm still looking. In these tables, yellow denotes an Increase and Red denotes a Decrease. 9 Games were disqualified due to playing on multiple accounts; not cheating. There have been some problems in the past few months with players not being able to read their Congratulations Neomail for PT. This has been fixed. There was a lot of debate about whether the games should be restarted and Flighttime finally ended the discussion by ending everyone's games. This is what the Main Page of your game showed after the games were restarted. In my example, I had just paid my rents when the message appeared. The March, 2005 game also ended at midnight NST. It appears as though this may be part of the game coding now. And he even gets hit by Supply and Demand. So now the selling prices won't change in your past sales to show the current selling price. No more running to make high priced plushies or being able to track prices that aren't in your current store inventory. Of note as well, your selling prices will ONLY change during your 10:01am-5:01pm game times. The February game ended promptly at midnight on February 28th. This caused a lot of frustration as it was the first time we had seen the game end this early. YAY!!! Hopefully he got the penalty problem taken care of. There is a "month-end" tax collection and many people had to pay unearned penalties as well as their taxes at the end of January's game. We are now 100% positive that the tax man comes exactly 6 days (to the minute!) from the time you CREATED your store and appears to be coming every 6 days thereafter. We'll know for sure as the month goes by. Let's make sure that everyone is with me on this. That's 6 days after you hit the button that says CREATE STORE when you very first started your game. If you have less than 50,001 nps Cash On Hand when taxes are collected, you owe nothing. The tax man also ignores the sales receipts currently in your store. Taxes are calculated at the exact time they are due. For instance, if your taxes are due at 10:30am but you don't update your game until 11:01, then you are taxed on what your COH was at 10:30am; not what was showing when you updated. Thanks Meili1 for helping to point this out. Taxes also appear to be due on the first day of the new month and some people are paying penalties even though they weren't late. Note: Numbers in italics are calculated figures based on percentage rate and tax taken. Thank you everyone for the information!! If you have any information regarding taxes, please neomail me. I will need your Cash On Hand either before or after you paid taxes, the %-rate, tax paid, amount of penalties (if incurred), and how late your payment was if you were late. Sirinja was kind enough to send me screenshots of her taxman page and the Main page after taxes were collected. Thank you so much!! During April, 2005 Sirinja found her Cash on Hand very close to 50,000 and decided to check something and verify it for the purposes of this petpage. Her results are in the table above and she also sent me screenshots of her current game. If you wish to use information that is available only on this petpage, please reference the petpage and its author. Thank you. Here's a reminder from Flighttime to be polite and keep a positive attitude on the PT chat board. Remember, you're there to either help or be helped. YAY!!! We can make Tonus, Rukis, and Yurbles now!!! To my knowledge, double-charges for shipping only happen if you refresh after you've shipped. Don't DO this!! Bad idea! If the page doesn't load, then go back to the Main Page and check your COH and warehouse contents to see if they shipped. Otherwise, you will be handed a nice Restart button. Yes...but do they have to steal EVERYTHING?? At the end of November's game, we tried to explain again that we were losing TONS of jobs due to the "clicking twice" glitch. You are now required to pay to upgrade the warehouse when you expand. Click HERE for a Warehouse Loading Table at all levels of the warehouse for batches of 100 as well as the expansion costs of the factory and warehouse. The time required for the warehouse to load your batches of plushies has undergone a drastic change. First, the size of a job affects the speed of loading; small jobs will load faster than larger jobs. For example, a few jobs of 100 in the warehouse will load within 30 minutes, but a few jobs of 200 will take close to an hour. Second, and harder to predict: The time required to load your plushies depends not only on the batch size but how many total plushies there are in the warehouse. The more plushies or the larger the batches, the longer it takes to load. For example, 4 jobs of 100 will take less than 30 minutes to load whereas 16 jobs of 100 will take closer to 40 minutes. I was running batches of 700 and 800's and when I was finished for the day, I had over 80,000 plushies in the warehouse to be loaded. It took roughly 8-12 hours for them to get loaded. Sirinja notes that when there are more than 100,000 plushies in the warehouse, loading can take up to 30 hours. For the best results, combine smaller batches in with larger ones to load overnight. For instance, 500's, 1000's, and 1600's work very well. 3 updates each producing 15 batches of 1600's and 1000's followed by 2 updates of 500's will load overnight. The selling price of all plushies has been drastically changed due to the new Supply and Demand. Plushies selling prices are not set in stone any more but rather reflect the plushie's relative position on the Supply and Demand list. 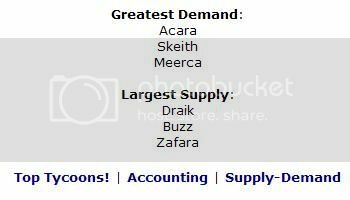 9/2/2004-Supply and Demand Tweak is Here! You now have a nice, shiny new link at the bottom of your Main Page called Supply-Demand. Well, this one answers a question we've all been having. This new tweak is based on EVERYBODY's shop contents. Setting your time zone is now required within 2 days of starting your game and BEFORE you pay any rents. If you do not set your time zone, it will automatically default to the NST time zone and you will not be able to change it for the remainder of the game. Raw goods prices are now randomized for everyone across all time zones. You will no longer be able to get the prices ahead of time. You can no longer dump materials whenever you choose as the link has been closed off unless you have 89 items or more in your inventory. After being loaded, your plushies will take about 5 minutes to arrive in your store and be added to your inventory. Keep checking the Main Page to see if they have arrived. For those of you unfamiliar with flighttime, he is the programmer for Plushie Tycoon. His advice and warnings should be heeded at all times. flighttime Don't touch my plushies! if it sounds too good to be true... it is. slowly closing all of the "secrets" some experts use. if you lost your game because of nonpayment of rent during the crash, you were pushing your luck way too far anyway. m_evard & kahlmek both paid rent the morning of july 19th, and both lost their games when the backup was put in place on the 24th. All cheats removed. Fun things in store for next month's game. Hint for next month's game. Total number of players in August game and a warning for September's game. Just copy and paste the following into each post for the new board. 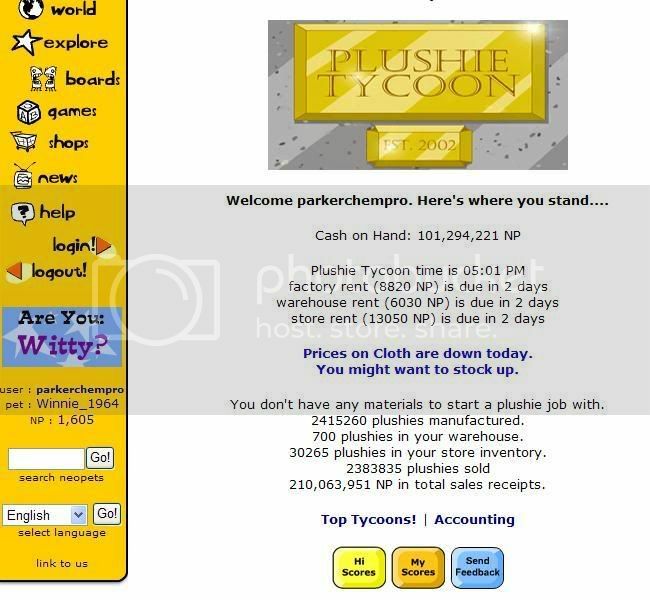 This is a place for Plushie Tycoon addicts to talk about the game and help new players. EVERYONE should be polite. Please be patient, it might take a few minutes before someone has time to answer your post. PT takes place in real time over a month. Many questions are addressed in the guides (see next post). Most of us are happy to answer questions AFTER you read a guide. Trophy or avatar question? Read the in-game help. New to PT? Haven't played in a while? Try out one of the guides we recommend on the Jumjim8975 petpage (that also lists the changes in the game). The only guide we recommend in the Neopian Times is in issue 179. The others are out of date. The taxman now visits periodically - In March, he's visiting every 6th day. Don't use your browser's back or refresh buttons on PT pages. We do NOT mention specific plushies by name; if all of us made the same one, the price would drop. Have fun! It's a game, and this is a nice place to talk about it. 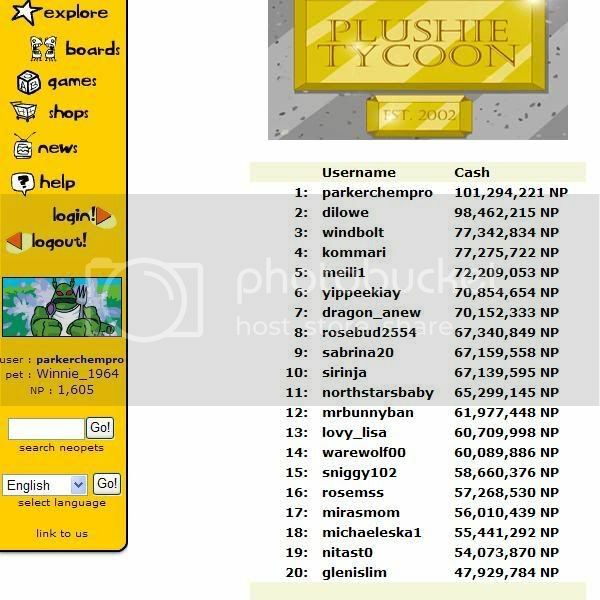 We take the game of Plushie Tycoon - and this board - very seriously. Chain letters, spam and repeated off-topic posts WILL be reported! This page would not have been possible without the priceless input from m_evard. 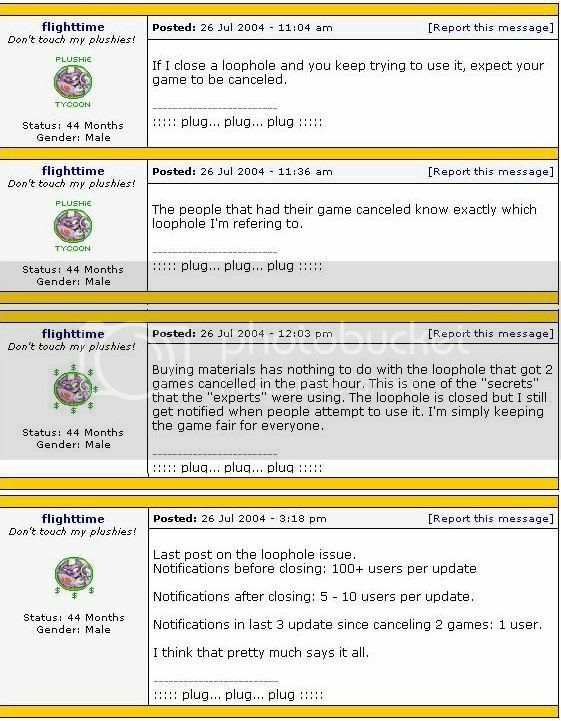 Some of the screenshots and posts from flighttime are hers and used by permission. She also read through everything and helped me make sure it was accurate. Thank you so much! The rest of the screenshots are from funandgames999. Thank you for sending me the rest of them. Thank you also goes to Sirinja for her information on the warehouse loading times. I would also like to thank flighttime for his tireless efforts to keep this game fun, challenging, and entertaining. Keep the tweaks coming!